This bucket is a "Must Have" in a horse trailer, because it fully collapses & can be stored flat anywhere until you need it. 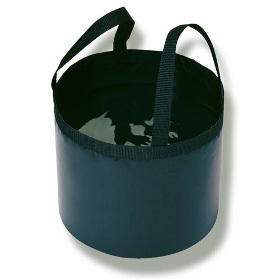 Made of 18 ounce vinyl, it's super sturdy & completely waterproof ---it can even be set down when full of water & not topple over. Perfect for offering your horse a drink in the trailer. Makes a great place to store a grain snack for your horse, and he can get his nose in it, too. Easily fits in your saddle bag for the trail. 2 sturdy handles. Choice of 2 colors.